We have another interesting program lined up for our Fine Dining Etiquette Talk & Dinner and we would like to announce that Master Marinah Ng of Marinah Numerologist will be giving an introduction to her numerology talk. Marinah Numerologist offers services in numerology consultancy. Marinah is a well known Malaysian numerologist who travels around the country to give talks on numerology. She has given seminars and talks at several corporate companies, Penang International Property Fair, roadshow and functions. She has also been invited to give talks overseas in countries like Australia and Hong Kong. "Numerology is the study of Numbers and its symbols. It is basically the study of the mysterious hidden meaning that numbers can provide about a person, place or thing. It is used to determine a person’s personality, strength, talents, obstacles to be overcomed, inner needs, emotional reactions and ways of dealing with others. The roots of numerology can be traced back to some 10,000 years or more to the time Egypt and Babylonia. By applying the principles of numerology and using birth date as the basic data, you can determine the frequencies of any individual. A numerological analysis of the calculated frequencies provides significant information on these people’s personalities and character." (source from Marinah Numerologist's website). Marinah will be giving free numerology report analysis to the dining guests attending this event. 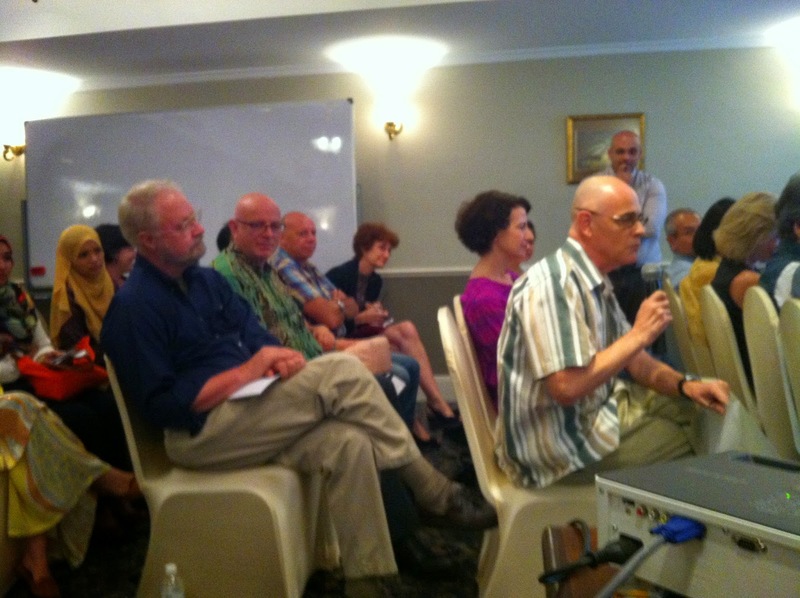 Our guests of this event are very lucky because Marinah Numerologist charges for their consultancy and usually give this report to the guests attending their seminar but for this event, Marinah is giving the report as a complimentary gift. Marinah will be analysing the numerology for each guest based on their name in their identity card, calling name (what the guest is fondly called by other people), chinese name, house number and car number. We appreciate Marinah's gifts to the guests of this event and would like to thank her for her generosity. We are bringing in a charity added value as part of this event and we are glad to have Befrienders Penang at our event. 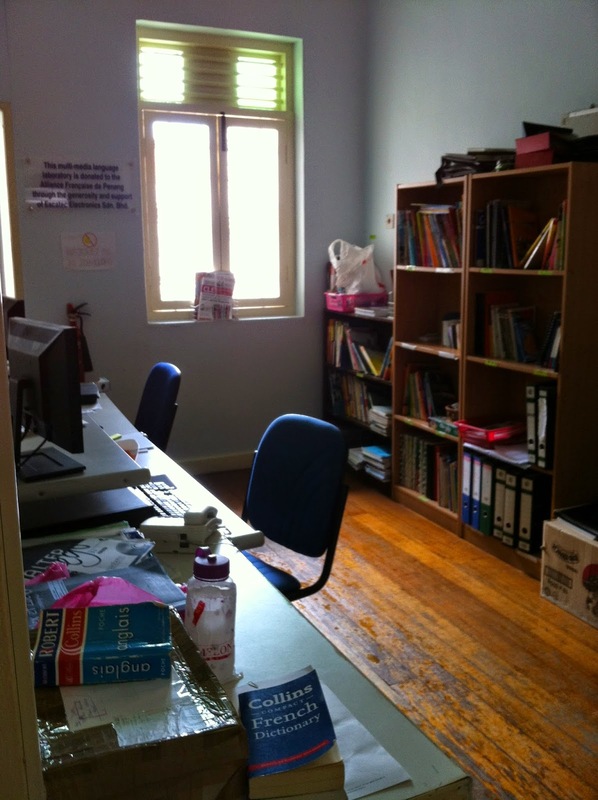 Befrienders Penang is a non-profit organisation that provides emotional support to those who are depressed. Befrienders Penang will be giving a talk on "Introduction To Befrienders Penang" which will touch on who they are, what they do and how they provide emotional support and help alleviate feelings of distress in the hope to prevent suicide. 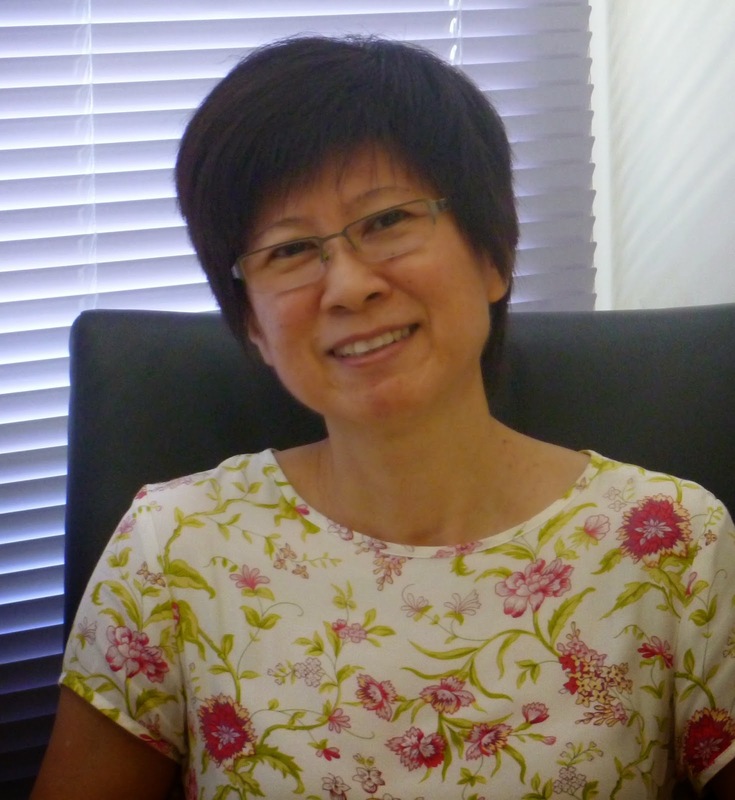 Their chairperson, Ms. Chueng Kwan Leng, will be present during the event to deliver the talk. During this event, our guests get to network with each other and it would be good to meet new people and talk. Of course, this is provided the guests are comfortable with talking to others as we understand some might feel more comfortable observing the environment and listening to the talks instead. Most of the time, events will allow guests to meet new people apart from learning or eating together and it would not hurt to meet someone new for that person might become your friend for life. Do not worry though, if you prefer to observe instead, as you can enjoy the food served and there will be talks lined up in our event programme. Every now and then, people might feel like they need someone to listen to them and find it difficult to speak to someone they trust, then this might lead to depression in some cases. Befrienders Penang can offer their service to listen confidentially to those who are depressed or have suicidal tendencies. If you would like to make a donation to Befrienders Penang you may donate to them directly at our event. We are also looking for kind companies and generous people to sponsor a booth and dinner tickets to their members who will be present at this event. For those who require tax exemption receipts, you may pay directly to Befrienders Penang who will issue you the receipt. In our previous blog post, we mentioned that one of the value for this event is the learning value as well as the reasonable pricing of tickets which includes dinner. Aside from these, another element that we would want to include is also the cultural value. This event will include a talk which will be a sharing session of those from different cultures and what are their dining etiquette. Every culture will have different etiquette and unwritten set of rules when it comes to their dining events. One of the most common formal dinner event held for every culture will be the wedding reception and even informal dinner events such as open houses can have different etiquette involved. It will be useful to know about other culture's dining etiquette so that when you are invited to a dining event held by another culture, you will avoid any mishaps in terms of mannerism so that you will not appear disrespectful to the host. 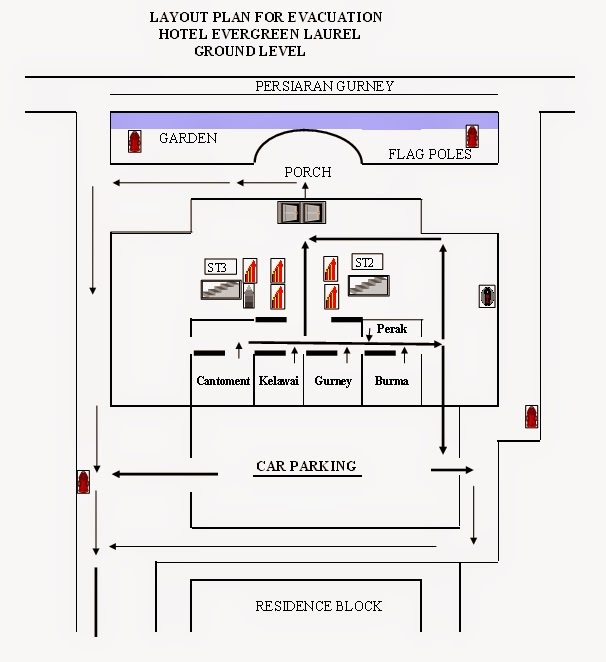 An example of an incident which we have experienced first hand was during an open house in a European country whereby a Muslim lady invited a group of her acquaintances to her open house during Hari Raya for lunch. One of the guests was a young, fine British gentleman who had impeccable manners and being a thoughtful guest, he brought along a bottle of wine as a gift to the host. He did not know that Muslims do not consume alcohol and when the bottle was presented to the host, the guests present at the lunch reception fell silent. The host quietly accepted the gift and someone standing nearby politely told the gentleman that the host in actual fact, does not consume alcohol due to religious reasons. The gentleman went red in the face and apologised to the host telling her that he did not know. It was actually good manners which lead him to bring a gift for the host. The host being her gracious self, told him it is fine, and she actually served the wine after lunch to the gentleman and her other guests that consume alcohol. This is one good example why it would be useful to know about other culture's etiquette so that you are not put in a situation which might offend the host. At the end of the day, it is about being tolerant be it if you are the host or the guest at a dining event but a little knowledge on other culture's etiquette will help you go a long way to avoid any blunders. 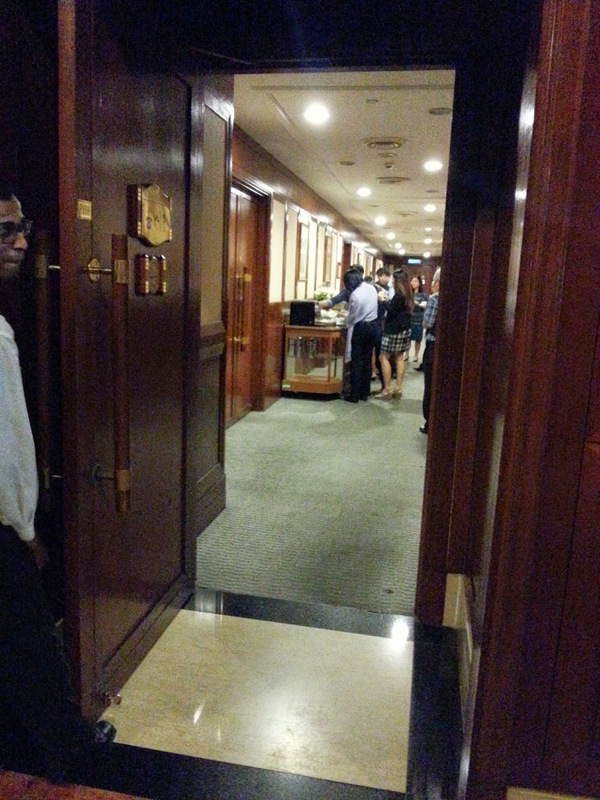 Living in a multicultural country like Malaysia, we are bound to be invited to dining events held by another culture. 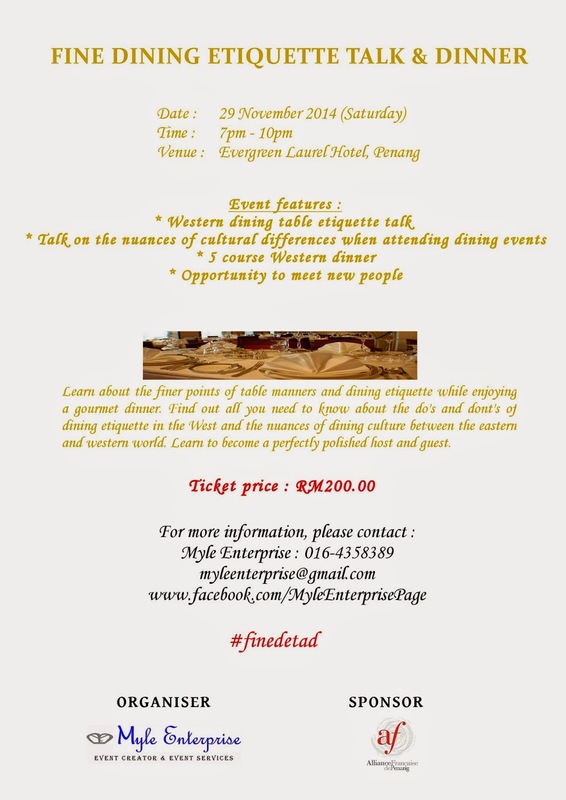 It would be good to attend our event and know a more about different cultures' dining etiquette. When we created this Fine Dining Etiquette Talk & Dinner, what we had in mind was to create a talk which can educate people on the dining etiquette. We would actually want to bring in the educational value to this event aside from having a dinner event where people get to meet new people and have good food. Dining etiquette includes table mannerism, how you conduct yourself at the table and the skill of using the correct utensils for the correct dining course. There are a lot of types of dining set courses, such as the mainly seen western 3 course meal, western 5 course meal and eastern 10 course meal, which is usually found at eastern wedding dinners. For this event, our talk is on the western fine dining etiquette talk. 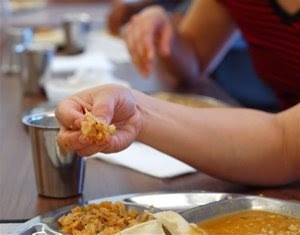 Why fine dining etiquette ? It is because the table setting for fine dining is more complex than an ala carte western meal (which would normally include the main dish served on a plate and the accompanying fork and knife/spoon) and we want our guests to learn the proper way to use those utensils. 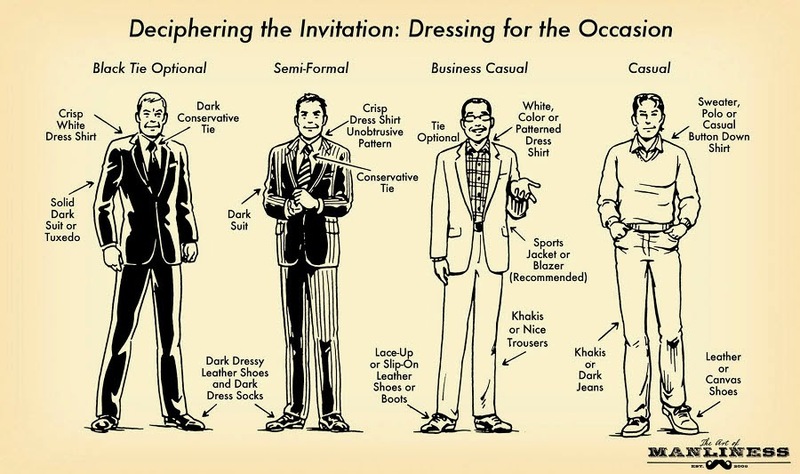 There are table mannerism (such as where to place your napkin when you leave the table) and also unwritten rules which comes with fine dining (such as observing the required dress code). These are useful information to be learnt so that people who attend fine dining events will know how to conduct themselves and this is a sign of respect for guests towards the host of the event and also to the other guests attending the event; and as for those who intend to host their own fine dining event, it will be beneficial for them to know how to conduct themselves. There were many who had the perception that our event is just a fine dining dinner and that is not the case. 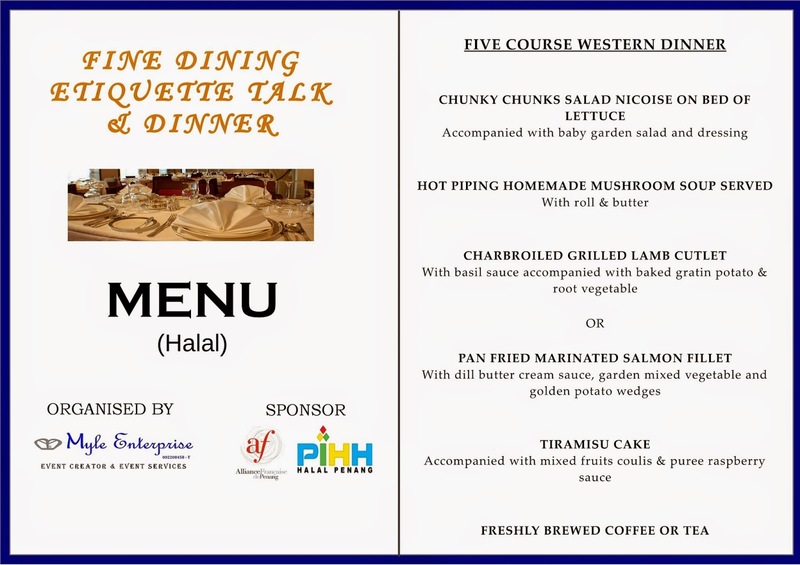 It is actually a talk on fine dining etiquette and the dinner served is a 5 course western dinner. This does not mean that the dinner served is of sub-par quality and in fact, the 5 course dinner menu was put together and prepared by the chef at the 5 star hotel we are holding this event in. That is fine indeed. The ticket price charged for this event at RM200.00 is very affordable considering that the dinner served is a western 5 course meal at a 5 star hotel and it includes talks by amazing speakers. We have other talks arranged aside from the fine dining etiquette talk. We could have charged more but we wanted to make it affordable this time so that people can come to learn as well as have quality good food in a comfortable setting and meet new people if they want to. Our ticket sales for this event is closing in 2 days' time in order for us to make the necessary food arrangements with the hotel involved. Please purchase your tickets before that if you are interested. We look forward to having you at our event. 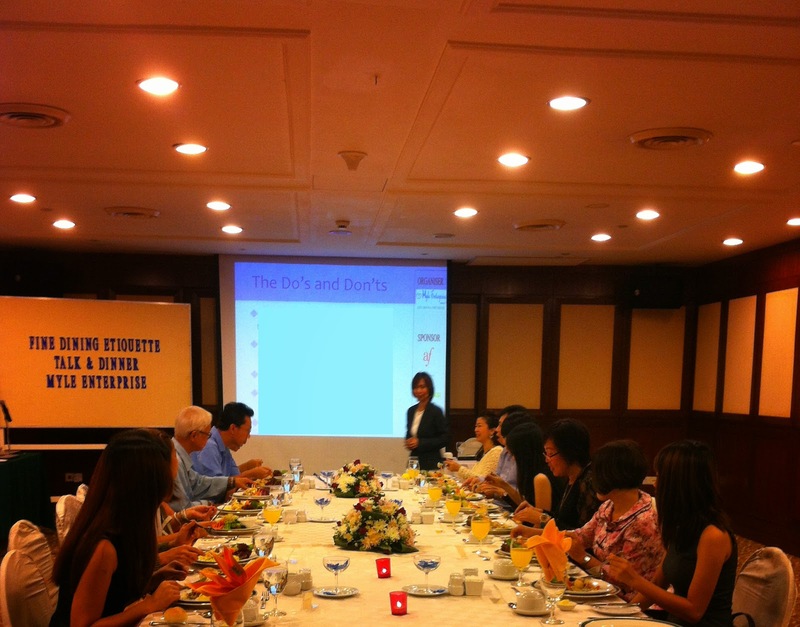 Our fine dining etiquette talk speaker for this event is Ms. Priscilla Jihen. Priscilla has had a vast amount of experience in giving training with over 10 years being a trainer. She is a trainer for personal grooming and dining etiquette is one of the modules under that. Priscilla has a Master of Arts in Marketing and she is qualified to Train the Trainers under HRDF. She has worked as a trainer for Alpine Corporate Training in Sarawak and now known as Trailblazers Leadership & Motivation in the Kuala Lumpur branch. Her experience included being a business coach, leadership trainer, marketing communications director and lecturing with a long list of clientele such as Coffee Bean & Tea Leaf, International Malaysian Education Centre, Country Heights Holdings Berhad and National Heart's Institute, Kuala Lumpur. Priscilla is passionate about volunteering, with her experience in coaching and assisting members of the Single Mothers/Parents Club to be able to support themselves financially; and assisting in counselling the Seventh Day Adventist Community Services. She is coming to Penang specially to give this talk on fine dining etiquette. Learn about fine dining etiquette and table mannerism so that you can dine comfortably without having to worry about making any etiquette mistakes. Do not miss this chance to meet Priscilla and speak to her in person. The dinner served during this event will be a five course western dinner. 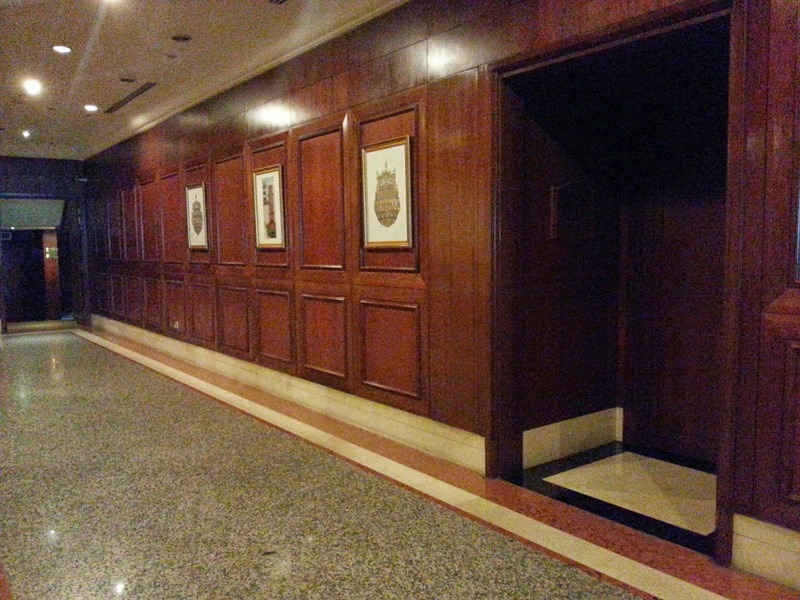 The food is halal and the menu is specially put together by the chef of Evergreen Laurel Hotel, Penang. 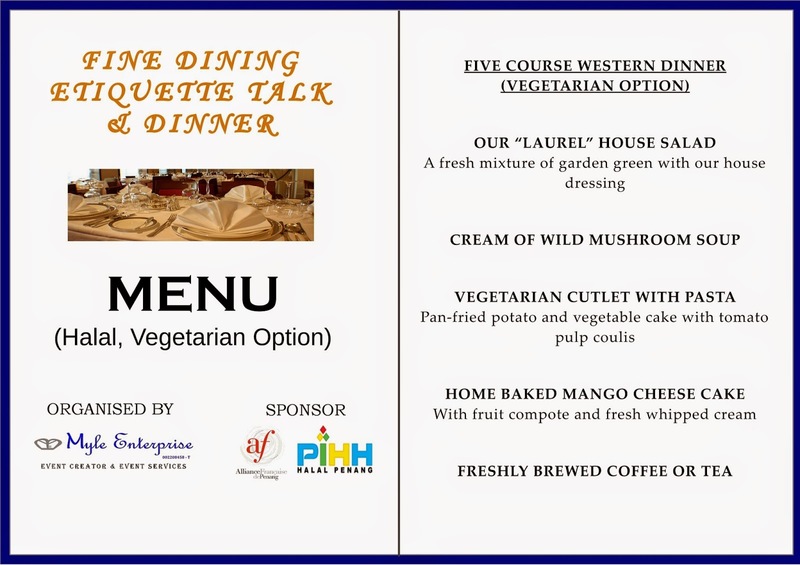 When we requested for a vegetarian option, the team at Evergreen Laurel Hotel, Penang managed to put together a menu for a five course western dinner for vegetarian. For those who do not take meat, do not worry when you join us for this dinner as we have a vegetarian option available. For our menu, you get a choice of lamb cutlet or salmon fillet as your main dish. Please choose one and let us know your preferred choice. These are our menu for the Fine Dining Etiquette Talk & Dinner. We hope that you have a good dining experience during this event. We have another recommendation by Simon Mok who shares with us his view on this event and why you should join us for this event. This is a video of Rosmaniza sharing her experience dining at a dinner hosted by another culture and also her view on our event. Here is a video on Christian Purnell from Australia sharing his story on his dining/drinking experience when he was in a different country (China). We asked Christian if he would recommend our Fine Dining Etiquette Talk & Dinner to his friends and this video shows what he has to say on this. The video can be found in YouTube here. We have been giving 20% discount off our tickets for the Fine Dining Etiquette Talk & Dinner. 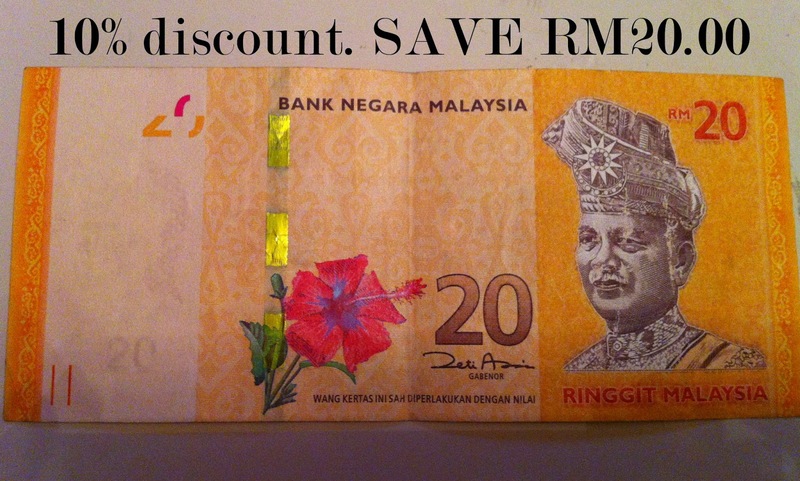 That is RM20.00, which you get to save and use for something else or put into your savings. At the moment, tickets are priced at RM180.00 and after the promotion ends, prices for the tickets will be at RM200.00. Please take advantage of this early bird ticket price, as the promotion for the discounted tickets will be ending on 23 October 2014 (Thursday) at 11.59pm. Early bird ticket promotion will be ending in 2 days' time. Ticket purchase may be made online via Eventbrite or if you wish to purchase it in person, you may contact us via e-mail or give us a call to arrange for an appointment. Our sponsor for this event is Alliance Française de Penang and we would like to let you know more about them. They are located at 46 Jalan Phuah Hin Leong, 10050 George Town, Penang, which is a corner house containing facilities like a movie screening room, which doubles up as an exhibition hall and is a library with seating area on normal days. 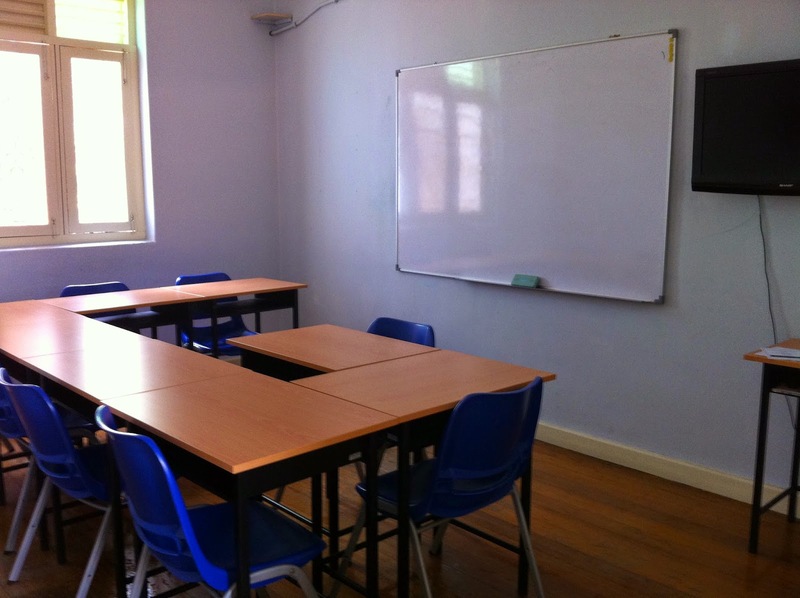 They have a dining area downstairs and on the second floor, they have rooms which can be used as classrooms as well as a multimedia laboratory. The Alliance Française was created in 1883 in Paris and was found in Malaysia since 1961. Aside from Penang, they have a centre in Kuala Lumpur as well. The Alliance Française has 1,040 establishments in 136 countries and they have more than 6 million people participating in their cultural activities (source from Alliance Française de Penang's website). Alliance Française de Penang (pronounced "a-lee-ons fwan-sey du Penang") is generally translated as the "French Alliance of Penang". They offer French classes, promote cultural diversity as well as spread awareness of the French culture through their events held. 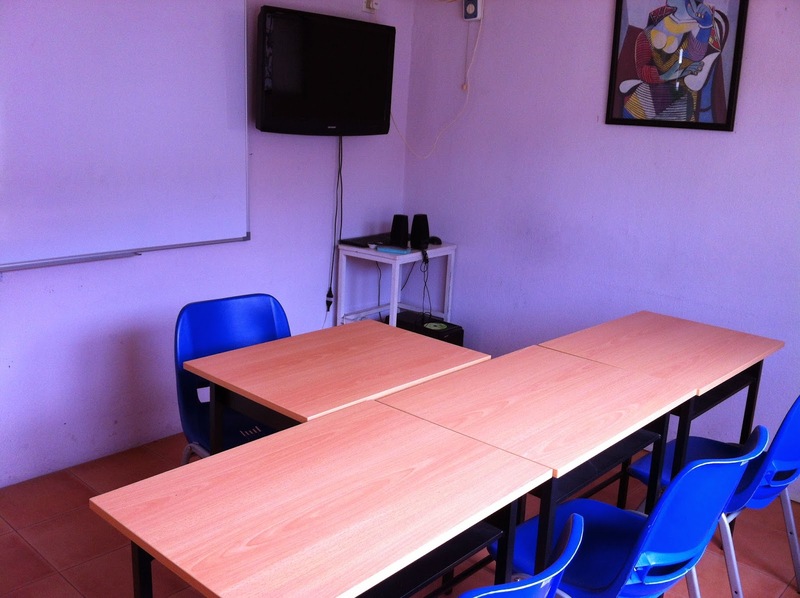 Their French classes can be for working adults, students, teenagers, children as well as for expatriates be it from the MM2H program. 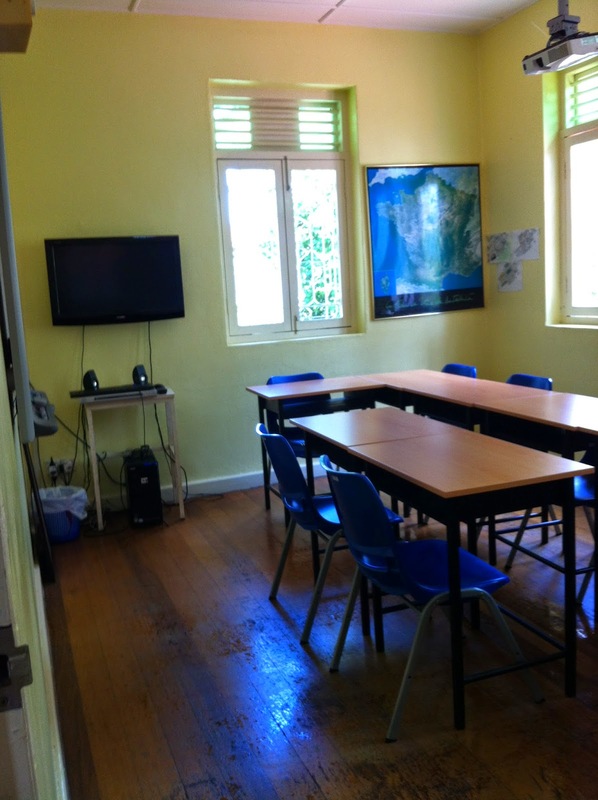 They also teach French to colleges, universities and schools around the Penang island. 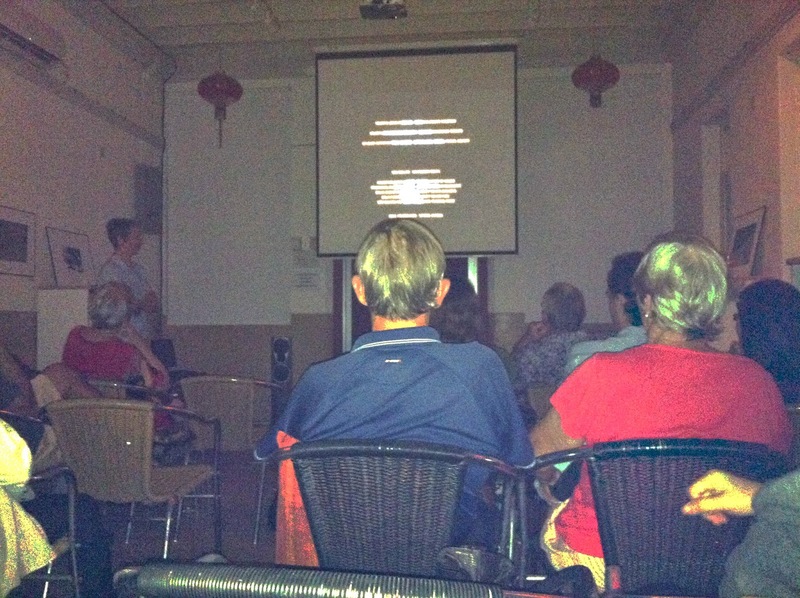 Some of their events include movie nights with more than one screening per month, workshops, art exhibitions, French Film Festival and dinners. 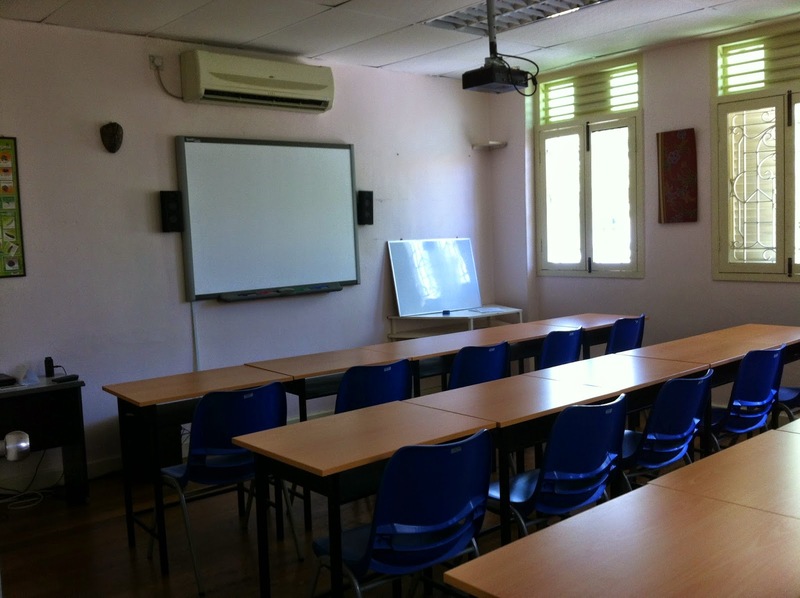 The Alliance Française de Penang also offer translation services from French to English and can include other languages. Myle Enterprise would like to thank Alliance Française de Penang for their sponsorship and support in our Fine Dining Etiquette Talk & Dinner event. The details for this event are as follows. We are currently doing a promotion for early bird tickets and you can get 10% (RM20.00) off if you purchase the ticket anytime from now until 23 October 2014. Please contact us to purchase the ticket in person or online via our event pages mentioned in the previous blogpost. Here is our flyer for this event which contains more details on the event highlights (updated as of 13 November 2014). We look forward to hearing from you and having you at this event. A warm welcome to our webpage specially created for our Fine Dining Etiquette Talk & Dinner event happening on 29 November 2014, Saturday in Penang. We will be posting on the happenings pre-event, during and post event here.